Most traditional strategic plans are too lengthy, complicated, and lack a real connection between strategy and execution. They often turn into “shelf help” (they look good up there), but our mission is to ensure you have a strategic plan that puts you in a position to effectively execute and to drive the results you seek. The core curriculum of this service is based on the “One Page Strategic Plan” created by Verne Harnish in Mastering the Rockefeller Habits (2002). Through research and performance analysis, we’ll customize the approach to your needs. Then we begin teaching, facilitating, and training leaders and their teams to not only create their one-page strategic plan (OPSP), but also how to implement and optimize it. The OPSP template is ideal for most clients, but we’ve found that customization is critical for quicker, more effective results. Recognizing this, we have redesigned it in a format that is easily altered to suit the needs, situation, and goals of each client. "By no means is the Scaling Up methodology the only resource we access and utilize. Through our alliance with Gazelles International we access a wide range of authors, experts, resources, exercises, tools, systems and process. The key, of course, is to determine what our clients need and when. This adds specific depth to our customization process. All Champion Coaches are Certified by Gazelles International. We have an extensive continuous learning and recertification process (second only to medical doctors) that ensures we are up to speed and ahead of our clientele and competition." 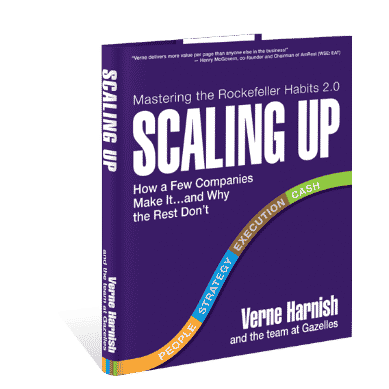 If you unaware of this toolset, we encourage you to go to www.gazelles.com or www.scalingup.com and to purchase and read “Scaling Up” (2014), Verne and his team’s greatly evolved and enhanced version. Scaling Up is the next iteration of this school of thought with an even broad range of ever-evolving and advancing exercises, tools, systems and processes. NOTE: We require all prospective clients to read and absorb this book prior to launching the training process. Ready to take your game to the next level? Get your meeting scheduled today. Ken Larson has an outstanding grasp of what is required to develop solid business practices that have the potential of moving a company forward. His enthusiasm and focus bring results. Ken was my executive coach almost ten years ago. He has an ability to engage and motivate individuals as well as remain totally supportive. He stuck with me through thick and thin while I was challenged with some serious health issues while managing a large Not-For-Profit organization with huge stresses and responsibilities. His foresight and personal experiences are the gifts he brings to any conversation. I still call on Ken whenever I need a coach and am in need of some honesty and compassion. 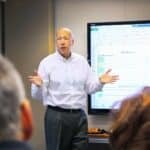 Take a former business professor, add a new venture start-up, then add a high performance executive coach like Ken Larson to help the professor become a national company president. I credit Ken Larson and my TEC membership with fast-forwarding GoForth Institute's success. I would have gotten "there" on my own - but I got "there" alot faster with Ken's help. © 2017 Copyright Champion Performance Systems Inc. All Rights Reserved.